A sample with lots of brilliant small crystals of Clinoclase, typical of the species. 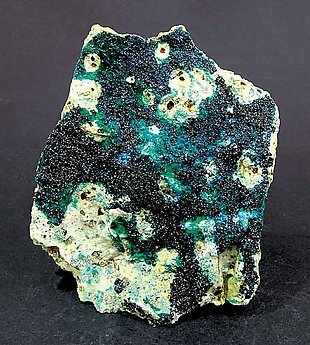 To add to this there are concretions of the rare arsenate Parnauite, which is a lighter green color. This comes from the David Lucas collection; number 575 and we will give the buyer David’s label. Radial and fan-like aggregates of very well defined Clinoclase crystals. 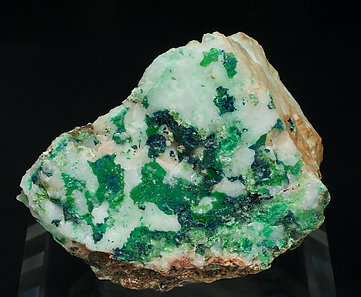 They have very acute terminations, a very intense and uniform dark green color and are on a Quartz matrix, with Malachite that has an appreciably clearer green. We will send a copy of the analysis to the buyer. Very unusual, as are many of the samples from this collection.